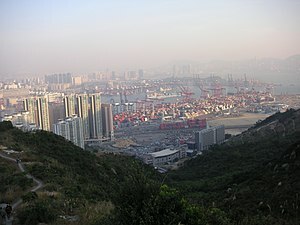 Container Terminal 9 or CT9 (Chinese: 九號貨櫃碼頭) is the 9th container terminal in Hong Kong. It is located on Tsing Yi Island, facing Rambler Channel. It is part of the Kwai Tsing Container Terminals. The total site area is 1.5 square kilometres and the terminal itself comprises an area 0.68 km² and as long as 1.9 kilometres. The rest of land is for logistics and storage. When the terminal was built the sea bed was dredged (dug deeper) to accommodate the largest container vessels. CT9 has 6 berths and a capacity of 3 million twenty-foot equivalent units (TEU). The terminal was developed by 3 operators; Modern Terminals Ltd. (MTL), Hongkong International Terminals Ltd. (HIT), and Asia Container Terminals Limited (ACT). ACT got two berths from MTL for two berths in exchange for contribution in CT9. Currently, HIT has 2 berths in CT9 and MTL owns the remaining 4. The berths were to be completed by the year 2005. There was a long dispute over the building of CT9 between the PRC and the United Kingdom beginning in November 1992. Hong Kong Government purposely diversified the number of providers of port services awarding project through a directed tender and Sea-Land consortium got the project. However, PRC insisted the tender must be open and competitive bid. The PRC alleged the results were in favour of British interests. The British company Jardine Matheson, a company with its listing and incorporation withdrawn from Hong Kong in the 1980s, participated in the consortium. The project was delayed until the Joint Liaison Group meeting of the UK and PRC in September 1996. Jardine Matheson was willing to be withdrawn from the project in acquiring two existing berths. After lengthy negotiation, the signing of the project was on 8 December 1998 and the terminal was opened on 22 July 2003. The delay of project caused substantial losses in Hong Kong in 1990s. The over-congestion in Kwai Chung Container Port caused cargo to be diverted to Shekou and Kaohsiung instead of Hong Kong. The decision of building CT9 on Tsing Yi Island aroused much concern from local residents. In the 1990s, the traffic condition worsened. The residents worried that CT9 would bring too many Heavy Goods Vehicles to overburden Tsing Yi Bridge and Tsing Yi North Bridge, worsening the condition. They hoped the government would build Container Terminals 10 and 11 in northern Lantau Island instead of CT9. With new highways, Route 9 (now Route 8) and Route 3, and the Duplicate Tsing Yi Bridge completed in late 1990s and early 2000s, some residents urged the government to complete the road infrastructure for CT9 before the completion of the berths. As recently as 2005 the pressure on the traffic became much lower. Another concern is environmental. CT9 is located near Cheung Ching Estate and Mayfair Gardens. The machinery and heavy goods vehicles would cause noise pollution to these residential housing estates. Moreover, the spotlights of CT9 would disturb the residents. The government decided to leave a buffer for building offices, serviced apartments or hotels to block the noise and strong light. It turned out the serviced apartment Rambler Crest by Hutchison Whampoa was sold as property. The seabed of the Rambler Channel was dredged to allow large vessels to berth in the new terminals. Those polluted and unpolluted muds and sands were moved to Cheung Chau and Sha Chau for treatment and storage. Greenpeace held a protest for the dumping of mud out of Hong Kong in 2000, fearing that the polluted muds would affect the environment of outlying islands. With expectation of high land container traffic from CT9, new road infrastructure was built on Tsing Yi. Tsing Yi Road, a road connecting from Tsing Yi Bridge to South Tsing Yi Island, was re-routed to the new road along the CT9. Stonecutters Bridge was built between CT9 and Container Terminal 8 (CT8) of Stonecutters Island, across the Rambler Channel. Nam Wan Tunnel was built, from CT9 to Tsing Ma Bridge and Ting Kau Bridge; it and Stonecutters Bridge were opened in December 2009. The new road infrastructure forms a net across the container port and connects to major highways in Hong Kong. On 9 May 2005 at noon, heavy rain storms during the day caused stacks of containers to collapse in CT9. 20 containers fell on two trucks in a wind of 135 km/h and one of the drivers was found dead. High stacking of containers, sometimes as high as eight levels, is not uncommon in Hong Kong; this aroused concern regarding safety and methods of stacking containers.